After 88 years, Idris Elba broke the “Flying Mile” record in the UK, going over 180 mph in a Bentley to beat 1927’s Sir Malcolm Campbell. The “Luther” actor is filming a four-part series for the Discovery Channel called, “Idris Elba: No Limits,” which will air in July. Just as #OscarsSoWhite has become a cause cé·lè·bre here in the USA primarily, across the pond, in the UK, the picture for actors and directors of color isn’t exactly rosy either. 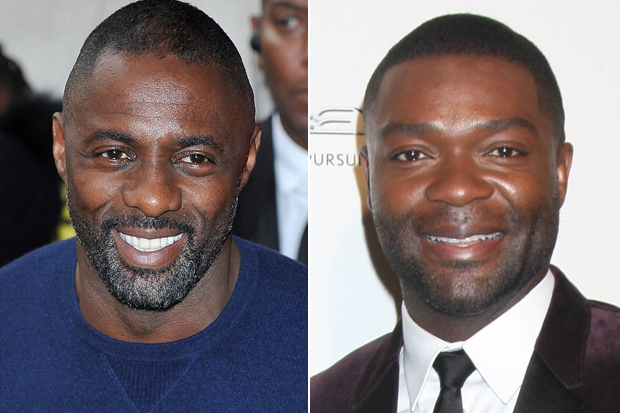 By now, I think we’re all familiar with the struggles of black talents in the UK, with the likes of Lenny Henry, Adrian Lester, Sophie Okonedo, David Oyelowo, and others vocalizing their frustrations with the lack of opportunity for black actors in the UK, and their having to go elsewhere (the USA specifically) to find work – a “trend” that many on this side of the pond frown upon, arguing that it effectively means that there’s even more competition for a limited number of opportunities. Now “Luther” star Idris Elba is also speaking out, although he’s taken his protest (if you will) all the way to the UK parliament, where he formally spoke to the members Monday, on the lack of diversity across British television, and its effects on talented black Brits like himself who are essentially forgotten. In his speech, he accuses the industry’s executives of not living in the real world. He argued that British television is at risk of not properly reflecting society, emphasizing that black actors in the UK are struggling to progress, especially when compared to black actors in the USA. BBC America has finally the much-anticipated return date for “Luther” starring Idris Elba – a one-night 3-hour special event on Thursday, December 17, 9pm ET. I would say that this puts it head-to-head with Shonda Rhimes night on ABC (“Scandal” at 9pm and “How to get Away With Murder” at 10pm); but both shows should be on by December 17, leaving “Luther” with likely little competition that night. Here’s the story breakdown for those who haven’t kept up with the series, courtesy of the press release: Struggling to cope with his own demons after losing so much, it seemed normalcy would always elude the emotionally impulsive detective. Teflon tough, even the strongest couldn’t endure what Luther has seen and been through. Hunting London’s most depraved criminals forced him to tap into the dark recesses of his mind, revealing sides of himself that would horrify most. The heartbreaking loss of his wife to a brutal murderer and his inner-circle of colleagues turning on him in a witch hunt weren’t enough to keep him away from the job. But watching his most trusted colleague and friend, Detective Sergeant Justin Ripley, die in his arms after getting caught in the crossfires of a case, finally pushed him over the slippery slope he’s always towed. A forbidden connection with serial-killer, Alice Morgan, offered him a somewhat skewed version of a happy ending and he took it. And here’s what’s coming in the December 17 special: This time we find Luther on a leave of absence from the police force, laying low in a rundown cottage. A visit from colleagues, Detective Chief Inspector Theo Bloom and Detective Sergeant Emma Lane, brings a shocking piece of news that draws him back to London in search of the truth. At the same time, a gruesome cannibalistic serial killer has struck the city, eating body parts as he goes. With a trail of clues leading from one crime scene to the next, Detective Superintendent Unit Martin Schenk and his team must work out the twisted logic that connects each victim. But this murdering mastermind is more than a match for Schenk’s police, outsmarting them at every step. It’s not long before Luther makes his triumphant return to the Bullpen, determined to capture the killer before another mutilated body joins the mounting pile. But he’s dogged at every turn by ghosts from his past. Isolated and volatile, it will take every fiber of Luther’s being to keep it together. Idris Elba has garnered both Emmy and Golden Globe nominations for his role as DCI John Luther, with a Golden Globe win in 2013. Written and created by Neil Cross and directed by Sam Miller, the “Luther” special also stars Laura Haddock as Megan Cantor, a mysterious woman from Luther’s past, John Heffernan as the sadistic cannibal Steven Rose, Patrick Malahide as George Cornelius, an old school gangster, and Michael Smiley returning as computer whiz Benny Silver.